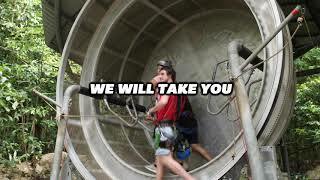 Jungle Surfing takes you into the beating heart of the Daintree Rainforest on a guided zipline experience through five tree platforms and the world's first Human Hamster Wheel cable lift. The platforms range in height from 7 to 16 metres above the ground and showcase every level of the rainforest canopy. The ziplines range from 37 to 95 metres and are travelled in pairs except for one solo flight - upside down if you dare! - across a rainforest creek. The final span to the ground features side-by-side racing ziplines with speeds over 40 kilometres per hour! Expert guides accompany you every step of the way controlling all equipment and flight so there's no experience or tuition necessary. And throughout the tour, the guides tell the story of the world's oldest rainforest. Jungle Surfing tours depart Cape Tribulation up to 12 times daily, operate in all weathers and are suitable for all ages from 3 to 103. It’s essential to book, especially during school holidays. 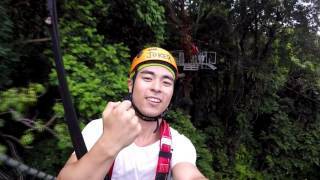 The most exciting way to see the rainforest! Jungle Surfing takes you into the beating heart of the Daintree Rainforest on a guided zipline experience through six tree platforms and the world's first Human Hamster Wheel cable lift. Their guides are with you every step of the way, offering interpretation on every platform and controlling your flight throughout the tour, so there’s no experience necessary, and the tour suits all ages from three to 103. The platforms range from 5 to 19.5 metres above the ground and each one reveals a different level of the rainforest ecosystem with spectacular views into the canopy, over the treetops, down to cascading streams and out to the reef. All tours depart from the Jungle Adventure Centre in Cape Tribulation, with courtesy pickups from all local accommodation. Tours run in all weather and they guarantee at least one hour up in the canopy.